Summary: From the New York Times bestselling author of Belong to Me, Love Walked In, and Falling Together comes a captivating novel about friendship, family, second chances, and the redemptive power of love. In all her life, Eustacia “Taisy” Cleary has given her heart to only three men: her first love, Ben Ransom; her twin brother, Marcus; and Wilson Cleary—professor, inventor, philanderer, self-made millionaire, brilliant man, breathtaking jerk: her father. Seventeen years ago, Wilson ditched his first family for Caroline, a beautiful young sculptor. In all that time, Taisy’s family has seen Wilson, Caroline, and their daughter, Willow, only once. I look forward to reading every book that Marisa de los Santos writes. She's definitely one of my go-to authors. 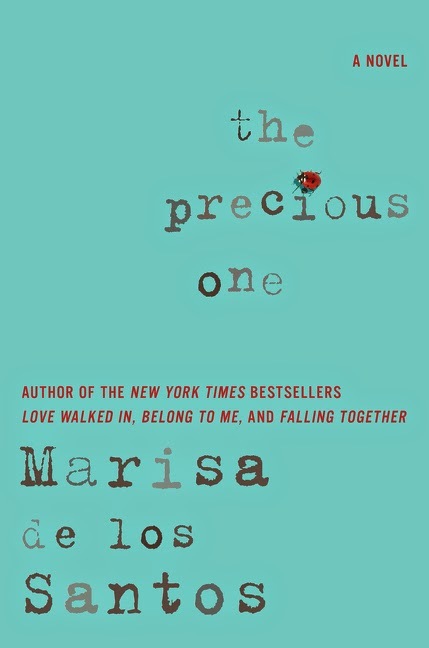 Her latest novel hits stores today and is titled THE PRECIOUS ONE. It offers a special story about two sisters who are both trying to get the attention of their father while finding their own way in life. THE PRECIOUS ONE tells the story of Taisy and Willow, both daughters of a domineering (and that's putting it mildly) father. Wilson is a self-made man and has found success as a professor and inventor at the expense of being a husband a father. Taisy, Wilson's daughter from his first marriage, doesn't have much of a relationship with her father ever since he left her, her twin brother, and her mother to start a new family with Caroline. When Wilson becomes ill, he invites Taisy for an extended stay. He wants her to meet her teenage sister Willow and write his memoir. Taisy, who knows next to nothing about Wilson and his new family, decides to visit; and in the back of her mind, she is still hoping to gain his approval. When she arrives in her father's home, she discovers that her sister Willow doesn't want much to do with Taisy. Willow is not exactly your typical teen (she's been sheltered by Wilson... once again, an understatement), and she isn't too happy about having her older sister show up. Naturally when Taisy arrives back home, a lot of memories from her past, both good and bad, come rushing back to her. Even as she begins her travels, she reflects back on her relationship (or lack thereof) with Wilson. She also remembers one of the loves of her life -- Ben... and how her father ruined her relationship with him. Meanwhile, Willow has some major changes occurring in her life too. She is finally allowed to attend high school, rather than being home schooled. Willow quickly learns that she doesn't exactly fit in with the other kids; however, she does have an affinity with her English teacher. As Taisy and Willow are brought together under these unusual conditions, they not only learn a great deal about their relationships with Wilson but also with each other. In addition, both women struggle to find their own identities and form new relationships. THE PRECIOUS ONE is told in both Taisy and Willow's voices, and the chapters alternate between their stories. I was impressed with how Ms. de los Santos managed to give each woman a distinct voice and I found both stories to be compelling in their own right. I should probably mention that I didn't exactly love either Taisy or Willow for much of the novel -- they both had their fair share of issues. However by the end of the story, I found that both had captured my heart and I was certainly hoping they found some happiness and sense of peace. One thing I really appreciated about this novel was how it explored family relationships. Wilson was definitely a piece of work, and while I doubt most of us have fathers like him, I do think women will relate to both Taisy and Willow. Granted they were both pretty extreme characters with extreme issues, but I do think they had some definitely personality traits that are found in every woman. In addition, I think the dynamics of the characters, especially those associated with the two marriages, were very realistic. Taisy's initial resentment of Willow and Willow's initial jealousy seemed to be quite authentic, and I was glad to see both characters were eventually willing to have an open mind about the other. THE PRECIOUS ONE would make a great selection for a book club. There is a reading guide available with thirteen questions. Some of the themes you might want to explore include family, loss, second chances, relationships, forgiveness, resentment, the need for acceptance, and finding one's true identity. I do think many of the characters in this novel are well drawn and complex, so there should be a great deal to discuss about their actions and their motivations. Overall, I enjoyed THE PRECIOUS ONE a great deal. I think fans of Ms. de los Santos and women's fiction in general will appreciate this novel. I've read other books by this author and enjoyed them very much. I was wondering how this one would be. I'm still a little on the fence about it. Maybe as summer comes. I've only read one of her books but I thought it was terrific. A friend of mine said this one starts out slow but then gets really good. I'll have to give it a try.